NFL superstar running back Reggie Bush believes former Parramatta captain and Dally M winner Jarryd Hayne will eventually play in the NFL. 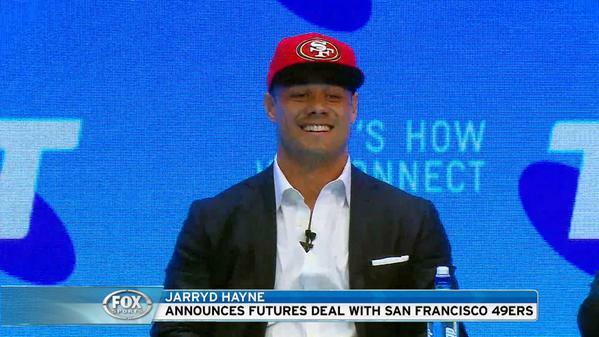 Speaking to The Daily Telegraph in California, Bush, who has now joined Hayne’s San Francisco 49ers from Detroit says Hayne will be a hit. “I’m sure he’ll make it, I don’t think there’s any doubt in anybody’s mind he’ll make the roster,’’ Bush said. “He has all the talents and athleticism to be able to play in this league and to be able to play at a high level in this league. “I think making the team is actually the least of his worries. “I got a chance to meet Jarryd back in Australia and I spoke to him a little bit and we talked about making the change over to making the NFL. “He has all the athleticism and the talent to be able to make it over in this league so it was just a matter of if he was going to take that chance and he did and now we’re teammates.